John Henry marks where pieces of steel need to be welded. John Henry bends down, hands on knees, eyeballing a piece of steel that streaks sideways out of a sculpture, straight as the path of a bullet. "Unless you want me to do something different, it's done," says Josh Dean, who works in Henry's fabricating studio and welded the sculpture according to Henry's precise instructions. But no, it isn't quite done. "This is scarred up kind of bad," Henry says, pointing to a spot on the metal. "It's got some splatter; there's a sharp edge right there. Otherwise, it looks good." He runs his hand over another crossbar in the piece, which is all angles, straight lines and solid rigidity, a trademark of his work. "There's a rough edge here," he tells Dean. "Go over all the edges with your hand, glove off. If you get cut, you know you gotta do something about it." When giving instructions, Henry's voice is calm, patient, experienced, the tone of someone who's in charge and doesn't see a need to push the fact. "He was an old-school person," says local sculptor Isaac Duncan III, who worked as Henry's crew chief for three years before opening his own studio. "You have to understand someone like John Henry, who's been through it and knows exactly what he wants. "He did listen to comments and criticism," Duncan adds, a grin in his voice. "However, pretty much you really needed to be right." There are no curves in Henry's sculptures. His pieces — which range from tabletop-size to skyscraper-tall — often resemble an explosion of metal bars frozen in mid-air or perhaps pieces from a game of Pick Up Stix that were dropped and somehow stuck together vertically and horizontally. Worth large chunks of change — his wife, Pamela, declines to give exact prices — his pieces can be found worldwide, from Korea to Venezuela, from China to Germany, in Switzerland, France, Italy and, of course, the United States. Several are here in Chattanooga, including the entrance to Chattanooga State Community College, at the University of Tennessee at Chattanooga, in the Bluff View Arts District and in front of Fire Station No. 1 on Main Street. "John is probably one of the premier living modernist sculptors of this century. There are not many people who've accomplished what he has," says John Clement, a New York City sculptor who has known and worked with Henry for more than 25 years. "People see his work all over the country; they know his work, but they may not know his name." And that goes for Chattanooga, where he's lived for 17 years. Henry, 73, remains something of a low-key fixture here. While he has hobnobbed with some wealthy and well-known names in Chattanooga — Scottie Probasco, Ruth Holmberg, among others — he doesn't come off as bragging when he mentions the relationships. It's more like shrugging — Yeah, I know these people; they're good friends; some of them have bought my work. He and Pamela also were the sparkplugs behind the creation of the Sculpture Fields at Montague Park, the 33-acre expanse that opened in April with 27 sculptures from internationally known artists; it's located just across the railroad tracks from the Henrys' home in the former Nickajack Hosiery Mill in Southside. "It wouldn't be there without John and Pamela," says Dan Bowers, the president of ArtsBuild who also sits on the Public Arts Commission for Chattanooga. The fact that Henry lives here "is a feather in the cap of Chattanooga it's a big deal," Bowers says. "He could live anywhere he chose to live and would be a bright spot anywhere he lands." 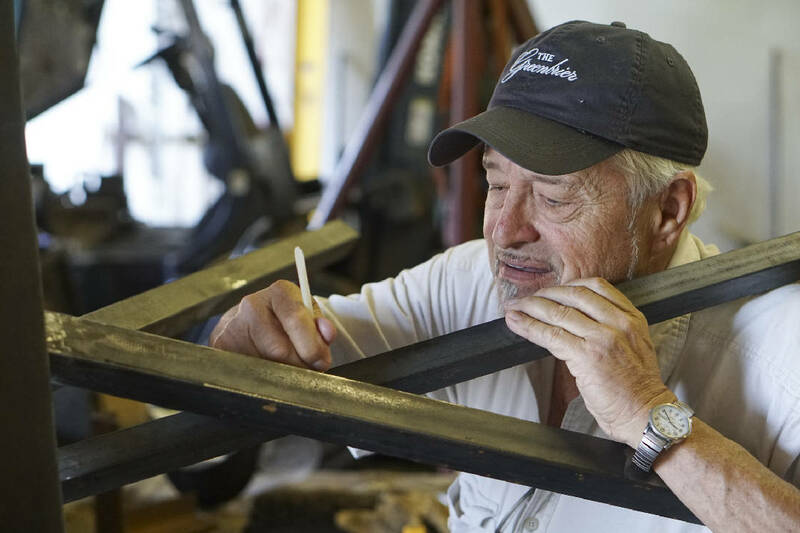 On Saturday, Henry will be given the Mid-South Sculpture Alliance's Master's Award for lifetime achievement, one of many awards he's won in his career. During the event, held at Chattanooga State, Henry will give a presentation then answer questions from the audience. Both Clement and Duncan, the president of the Mid-South Sculpture Alliance who'll be at the award ceremony, use the word "mentor" when describing their relationship with Henry. Both also say working with him was like earning a "Ph.D."
"I received my Ph.D from the school John Henry built," says Duncan. "I learned how to demand perfection. I loved working for him; it's the greatest thing that has shaped me and supported me. I was put through the fire." Clement, whose work is all curves and spirals compared to Henry's straight and angled pieces, says Henry continues to stimulate his own creative impulses. "I draw inspiration from all of his work. I draw inspiration from who is he and how he came to be and how he continues to be," says Clement. Pamela, who describes her husband's personality as "driven, builder, dreamer, problem solver," says one of his driving ambitions is to pass along whatever knowledge he's gained to next-generation sculptors. "John does not think of himself as anything special for what he has contributed," she says. "He just gets up every morning and does what he does. He doesn't think about if anyone will notice or care." After more than four decades in the business, Henry admits that certain aspects of making sculptures no longer hold the appeal they once did, but some elements still fire him up. "The work still excites me; the ideas are still coming as fresh as they ever did," he says. "The range of probability of what I can think about is still exciting, to the point of euphoria sometimes." Henry's entire business — fabrication studio, machine shop, art gallery, business office — is located in and around the Nickajack Hosiery Mill, which he and Pamela bought when they moved to Chattanooga. Given free rein in the building are Piper, a black-and-white spaniel that tends to appear under your feet with no warning, and Bridgette, a mountainous Great Dane who believes she's a lap dog. In fact, large things are a staple in Henry's life. In the wide-open, tall-ceilinged space outside the business office sits one of his massive sculptures, a rare one made of wood. The untitled piece is put together from pine trees that fell during an ice storm, Henry says. It was cut up with chainsaws, then he connected everything by himself, using hand-operated hoists to lift the logs and locking them together with bolts the size of a bratwurst. His metal works can be gigantic, too. In 2007, he built a sculpture titled Tatlin's Sentinel; it's 101 feet tall and weighs 60 tons and now is in Dallas. Wearing jeans, a white-cotton workshirt and a black baseball cap from The Greenbrier resort in West Virginia, the compact Henry looks like someone who's been carrying heavy objects on his shoulders for a long time. Inside his fabrication studio, located across the street and outside the mill's remote-controlled gates, he weaves around tables, grinders, saws, cutting torches, welding materials, hammers, sanders, chunks of metal — you get the idea — heading for the piece Dean is working on. On the other side of the studio, his second assistant, Henry Wolf, is repairing a forklift, often needed to move Henry's sculptures from studio to transportation, in this case, a show in Dallas in about a month. Henry points to a sculpture that's about 9 feet tall and sort of looks like a Christmas tree if Christmas trees had spikes growing out of them. "That one right there weighs 800 to 900 pounds," he says. But that's actually no big deal because it'll fit in a trailer, he adds, unlike some of his gargantuan works, whose pieces must be carried on a flatbed truck then put together on site. Although steel is his medium now, Henry actually started his art career as an abstract painter back in the early 1960s. But, while a student at the prestigious Art Institute of Chicago, he found that sculpture touched him more deeply. "I just enjoyed the physical nature of building sculpture as opposed to the intellectual exercise of being a painter," he explains. "Painting was all about illusion and trying to create a realty. Sculpture is about dealing with reality. "It's the way sculpture occupies space; paintings don't occupy space; they hang on a wall and you pretty much know where they're going to go," he continues. "Sculpture, like architecture, reality deals with the space that's occupied by human beings. That has nothing to do with paintings." A high school graduate at 17, married at 18, Henry came from a family of home builders and real estate developers outside Lexington, Ky.
"I was on a bulldozer when I was 11 years old," he says. With that background, it was almost a given that he would go to college to study architecture and he did, enrolling at the University of Washington in Seattle. Even in architecture, art classes are among the first courses required, so painting was part of the curriculum. He sold paintings while in Seattle, at one point hanging them on the chain-link fence outside the 1962 World's Fair. But he also stuck a toe into sculpting waters, carving pieces out of redwood, which was plentiful and cheap in the Northwest. "I made a number of pieces, maybe 20 over several years in Seattle," he says. "I carved one piece that was around 12 feet tall. "I've got pieces all over the Seattle area, wish I had them all back. I look back on some of that work as really formative in terms of where I was in relation to what I became." But it "was impossible to get a decent job" in Seattle, so he came back to Kentucky to work in his father's homebuilding business during the day and study art at the University of Kentucky at night. Even then, however, the idea of being a full-time artist was farfetched, he says. "I couldn't conceive of myself making a living as an artist. I didn't know any role models," he recalls. Fate intervened. He received a scholarship to the Art Institute of Chicago, one of the premiere — if not the premiere — art schools in the country. It was there that he discovered a true knack for metal sculpture. His friends at school were sculptors, he says, but they were having problems figuring out the structural and physical necessities of actually putting the pieces together, a situation that fit Henry's personality. "I was a solutions guy," he says. "I just found out that sculpture is a whole lot closer to my sensibilities. There was never a period of saying I was never going to paint again, I'm going to make sculpture. That didn't happen. It just happened very naturally. "I entered the Art Institute as a painter, and I came out as a sculptor." But not right away. While at the institute, he was offered a couple of teaching jobs, one in Iowa for the summer and another in Wisconsin in the fall. Most artists he knew made their living as teachers and produced art on the side; very few could make a living as a full-time artists. One of his friends at the Art Institute was Richard Hunt, the internationally renowned sculptor. Henry gave him the good news about landing the teaching jobs, but Hunt didn't react like Henry expected. "Then he said, 'John, if you put the same amount of energy into your work that you put into a teaching job, you'll go much further and you'll make more money.' I thought, 'He's crazy.' But he was right and, after two years of teaching, I quit because it just was in the way." As a professional artist often creating outdoor pieces, he stayed in Chicago about seven years; then the winters finally got to him. "Winter in Chicago outdoors is just murder," he says. Putting up scultpures was a viscious cycle — freezing to death for a few minutes, going inside for an hour to warm up, heading back outside and freeze for another few minutes before heading back indoors. "It reached a point where I realized, 'I don't want to live like this.'" So it was off to Houston, but the winters there were full of cold rain, so he headed even further south to Miami, where he met Pamela, a stockbroker, in 1982. At that time, he and his friends had already built something of a reputation for, as she puts it, "chasing blond stewardesses." "We caught some, too," he says, smiling. Still, in time, she tamed his impulses and they married in 1984. "I met him when he was 40, and I thought, 'Oh good, I'm getting him on the downslope,'" she says. "But he's still wearing me out. "John was known to not sleep. He was so excited about what was going on in life and all the things that he could do and get away with, he would stand in the corner and sleep for five minutes standing up, like Edison." He smiles and says that, these days, he "sleeps better than I used to." "I got six hours last night." They stayed in Miami until 1989 and owned an art gallery — T.Curtsnoc ("construct" backwards), but it was burglarized — which "depressed me about Miami," Henry says — so they bought a 10-acre farm in Kentucky's southeastern mountains. While placid and comfortable and beautiful, Kentucky proved too hard to get supplies such as steel, welding equipment, bolts, even skilled laborers and people to repair equipment. They started scoping out other spots, wanting somewhere that offered pleasant surroundings while also providing easy access to the supplies Henry needed for his sculptures. Chattanooga was it. "It was exactly what I needed," Henry says. "Everything is five minutes away — welding supplier, bolt supplier, everything you need, even the steel suppliers. I can order something by 4 in the afternoon and it's there by next morning. You can't even do that in Chicago." These days Henry knows — or more precisely, Pamela knows, having a memory for such things — that he has 58 pieces in Korea, but the numbers in other countries are fuzzy. They both run down a list of numerous countries where his pieces are located, and yes, they've traveled to those countries for the installation of his pieces. "We have seen the world just by his career, but we've never had a honeymoon," Pamela says. "But we've had a bunch of fun business trips," John says, smiling. Once in Chattanooga, they immersed themselves in the city's art scene, making connections and friends. After years of the Henrys' planning, handshaking, convincing and fundraising, groundbreaking ceremonies were held for the park in November 2014. It opened this year on April 8. Installing the 27 sculptures was Phase 1, a visitors center is Phase 2 and the third and final phase will bring 25 more sculptures and build an amphitheater. Among the sculptures already in Sculpture Fields is Henry's "Bette Davis Eyes," a rust-colored, elongated piece that sprawls across a hill. Don't go looking for deep meaning in the name or some sort of physical representation of it in the sculpture. Henry made it in 1981 when the song "Bette Davis Eyes" was a big hit; he liked the song, so he named his sculpture after it — so much for artistic inscrutability and symbolism. "She was shown a photo of the piece in the newspaper and asked 'Do my eyes look like that?'" Henry says with a laugh. In the beginning, Henry went with simplicity when naming his pieces — No. 1, No. 2, etc. — but people don't like to buy art that's numbered because it sounds too much like rolled off an assembly line. So he started giving proper names to his work, including, at one point, the names of strippers, he says. Conveniently, his aging memory prevents him from remembering those names, he adds with a slight grin. Back in his fabrication studio, he picks up chalk and mark spots on another sculpture he's taking to Dallas. The chalk indicates where he wants lengths of steel to be welded; they'll crease across each other, intersecting at various angles both up and down. Having been a sculptor for so long, he can see what he wants in his head and doesn't need to sketch out any of them, he says, except when he's exploring a new idea or an artistic element he's never tried before. "Sometimes we'll sketch things out if it's something that's completely off the wall," he says. "When you get to the larger pieces, which are done in the machine shop, sometimes drawings are necessary." And it's those creative impulses, the urge to take something from his imagination and see it realized in steel, that continues to excite him. "The conceptualizing of a piece and the mock-up or getting pieces in place but not finished, that's not easy but it's enjoyable. It's a very positive kind of process," he explains. But then there's the actual manufacturing of it — the welding, the sanding, the grinding, attaching the various pieces, then welding, sanding and grinding some more. Those tasks he can do without. "Going back and putting all the finishing touches on, milling the thing down to exactly the way it has to be, fastening it together it's drudgery," he says. "The creative process is gone; the excitement for me is gone. "Walking in and seeing the completed piece is still exciting, but that period in-between it's well, my pay grade is a little bit above that right now. I have to budget my time to be the most productive. I don't throw everything to my assistants, but I make sure that it meets my quality control." So the ultimate question becomes: Is making sculpture still fun or has it become a job? "Now, do I want to quit and go fishing? Hell no." Contact Shawn Ryan at 423-757-6327 or sryan@timesfreepress.com.